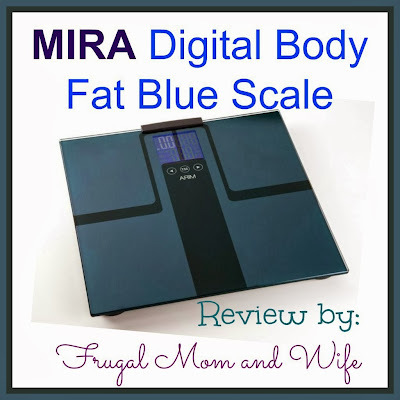 Frugal Mom and Wife: MIRA Digital Body Fat Blue Scale Review! 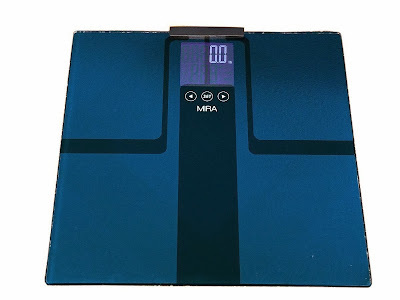 MIRA Digital Body Fat Blue Scale Review! When you're fighting fat you need to know the truth about your weight, body fat, and body mass measurements. The MIRA weight scale is super-accurate, precise and reliable. It is not a liar, it is an honest scale, I tested it myself. It won't deceive you about your real weight or body fat measurements so that you can stick to your diet plan and achieve success. What's its secret? The MIRA digital fat analyzer utilizes BIA (Bio-Impedance Analysis) state of the art technology to relay a low-level electrical pulse to your bare feet to analyze your body fat and water measurements so that weight, body fat and body mass readings are as on-target as possible. Simply step on the scale to instantly start your measurements. Then, easily view weight, body fat, and body mass measurements on the backlit MIRA display. It's has pretty much every feature your looking for, the all in one package. An added bonus is MIRA weighing scale's personal profile feature. This handy feature stores eight different user profiles so that the MIRA weighing scale immediately recognizes you as soon as you step foot on it. This custom touch makes the MIRA digital scale a double duty scale, far outperforming the average digital weighing scale. Everyone in the household will receive personalized accurate measurements without having to adjust the scale to suit their individualized needs! The MIRA accurate weighing scale has all the weight-management tools you need- plus a two-year manufacturer's warranty for added peace of mind. Team up with MIRA to win your war on weight control. Do you have trouble reading the weighing results from your old scale? Well, this is not a problem with its huge backlit LCD display, you could easily read the measurements! Regardless of the distance and angle, readout could be clearly seen. Since its digital, it requires four triple-A batteries to operate. (which is included) However, with automatic switch off feature, the battery life would last for quite some time. I just love that! The mirrored blue design sealed with glass is simply gorgeous. It it very easy to use and I am impressed that it comes with a two year warranty. So unless I break it, I'm covered. 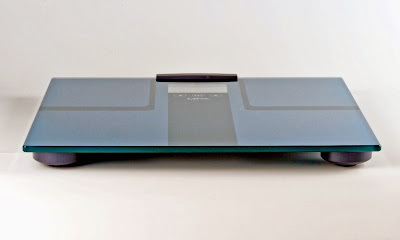 Overall this scale is a very smart and elegant way to accurately weigh yourself. Seriously, my whole family tested out this scale and it recorded each one of us individually. It was like magic! 65% off on Amazon! Only $34.99!! That's a savings of $65!! I have an old school scale and sometimes I have a very difficult time reading it. This looks great! Thanks for sharing. I would to know my body fat. The one I am using right now is not digital. I know having a scale that tells you your body fat etc, helps to really put things in to measures and really get a person motivated. I have been looking for something like this for my; grandmother! I know that seems random, but she has health issues so she really has to watch her weight gain or loss. The reg. scale is so hard for her to see this would be perfect for her!! Not to mention I would love using the body fat part! That feature is awesome!! I really need a new scale and this one looks like it would be perfect! Thanks for sharing!